Building a backyard rink is a great way to play hockey at home with friends. Unfortunately you can’t just toss a rink up, there is a right way to build a rink and many wrong ways. This article will help you learn how to properly build a rink suitable for your family. This article answers a lot of the most common questions surrounding building a rink, we also have a detailed article on building a backyard rink. For this Q&A I have entrusted Jim Stoller from NiceRink.com to write this article as he can draw on many years of experience. ICE is ICE, but for 21 years, since 1991 and 10’s of 1,000’s of NiceRinks in people’s yards later, we’ve got a pretty good handle on what to do AND ALSO what not to do. Most of what we’ve learned, written and solved has just been reworded and reposted by others. Since 1991 the goal has been SIMPLE SOLUTIONS for the backyard rink builder. With time comes experience; with experience comes knowledge, knowing how to use that knowledge is what counts. Let us help you be successful with our Experience and Knowledge! Hello Everyone, Jim Stoller, President of NiceRink here. A quick background of myself, NiceRink and its 65 year history. That’s right, our main company has been in the plastics industry since 1948, bringing you three generations of plastics know-how to back up our over 150 years of family hockey/skating history. A hockey history that includes playing, coaching, hockey directors, being a dad coupled with multiple state & national titles and years of Junior “A” experience. We don’t just make and provide backyard rink products; we live and breathe hockey and everything that comes along with it. How cold does it have to be? When can I skate? The obvious answer to this is 32F/0C. The more intricate answer and what clients really want to know is, after I fill the rink up when can I skate on it. That answer has many variables depending on how and what you build/liner your rink with and the lovely weather. Best case scenario is that you’re utilizing a WHITE liner to prevent heat absorption from the sun. Using a liner that holds the water, your deep end should be no more than 10”/25cm deep. The outside of your boards should be light in color or covered with the white liner at the start to prevent heat absorption. Let the ground cool down for a good amount of time before lining and filling. If you have all those BCS factors in place and you wait until your NIGHTS are getting to 23F/-5C to 18F/-8C and your DAYS aren’t getting too much warmer than 36F/+2C, you should be able to skate in 3-5 days. The cold nights are the trick assuming everything detailed above is in place. You’ll build more ice during those night time temps than the daytime temps can melt. Therefore you will be gaining ice thickness each night. “Usually” 3”-4”/8-10cm will hold most kids and average size adults. Will a backyard rink wreck my grass? Depending on how you build your rink and what type of liner you use, will determine the health of your grass. With a WHITE liner and the FLOOD method, we have seen a 99.9% effective rate in turf health. On the other hand, if you use a clear, blue “tarp”, black liner and/or just flood the grass, that % goes way down. Several factors are the cause: Not enough sun penetration, too much sun penetration, flooding the root zone of the turf are all causes of dead spring grass. How big can I make my rink? What size should it be? The size of YOUR rink should be determined by several factors. The first factor is your available space. If you have the space and budget, go big. You’ll enjoy your rink much more when you have more room, especially when you have skating parties (which I can assure you, you will). Everybody will have plenty of room to skate around without bumping into each other. If you’re not sure if you’ll use your rink enough to make a big rink worth your while, start smaller. You can always decide to go bigger in a year or two, and continue to use the boards and equipment that have already been purchased. On the other hand, if you’re an experienced skater yourself, you’ll be able to cover a 30’/9M span rather easily with one stride, which doesn’t end up being really fun if you’re an avid adult skater. 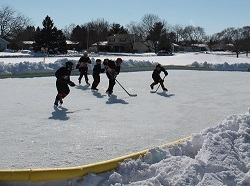 As a quick “guideline”, when my son was 17-18-19 Jr A, the boys came over and our NiceRink was 44’ x 88’ (13.4M x 26.8M) and it served them very well for 3 on 3 and even were able to play some 4 on 4 with the BIG boys out there. This basically comes down to time vs. money. There are a LOT of great problem solving NiceRink products available that you can simply “install” instead of having to “build”. Custom NiceRink Brackets, NiceRink Boards, BumperCaps, KickPlates, Nets and endless other options. Then there are always those people that are very handy and have the tools AND the TIME to create their own board system. That’s fine too! It can be as simple as a bunch of 2×4 (5cmx10cm) wooden stakes and plywood, or as eccentric as a complete refrigeration and board system and range from $200 to $100,000 and virtually anywhere in between! Once it’s built, filled & frozen….ice is ice! It’s just how you get there. When should I build my rink? The best time to build/setup your backyard rink is just prior to the weather turning freezing. This is for two reasons. First, you want to be all setup and ready to fill/flood when the cold arrives, not setting up. Secondly, it’s a heck of lot easier and more comfortable to be working outside and installing stakes/brackets into the ground when it’s 50F/10C and the ground isn’t frozen. The best answer for this is not a date, but rather the weather forecast. As a rule of thumb, in Southeastern Wisconsin, I usually install my brackets and sideboards the weekend before US Thanksgiving around November 15th or earlier and lay out the liner 2-3 weeks after. By giving it a good 2-3 weeks, it will also give the brackets and boards a chance to “freeze in” and let the grass go dormant. By then you’ll have those good cold nights mentioned in item #1. This will obviously vary greatly depending on where you are located. How much does a Back Yard Rink cost? As stated above, it can range from just your time to spray water, to $340.00 for a NiceRink 20’ x 40’(6M x 12M) Starter Kit, to $3,800 for a 44’ x 88’(13.4M x 26.8M) NiceRink Gold Package to $25,000 for a 20’ x 40’(6M x 12M) Refrigeration system. Anywhere in between and higher, all depends what you want to do. $0 = Lots of time and must have cold weather. If you live in say Winnipeg where it gets and stays cold this may be an option for you versus someone who lives in say Central Ohio. Once the ground freezes and you get some snow, pack all the snow down to compact it, spray it lightly to saturate the snow to a “slush”, let that freeze and then spray thin layers over the top of the frozen slush to “build” you ice. $340.00 = NiceRink 20’ x 40’(6Mx12M) Rink-in-a-Box. Great-Simple start to your backyard rink endeavors. This is a “key components” kit to get you going and then you can expand upon going forward. You’ll still need 3-5 sheets of ¾”/1.9cm plywood which will run another $200-300, but you can use them to make your rink bigger in the years to come. 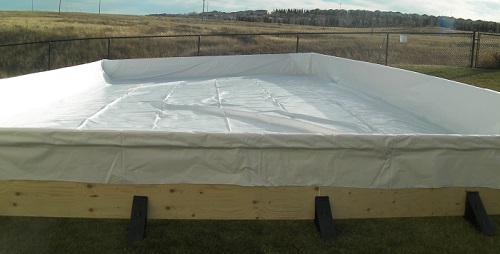 $3,800 = 44’ x 88’(13.4M x 26.8M) NiceRink Gold Package. This is a complete kit including NiceRink Brackets, NiceRink Plastic Boards, NiceRink Liner, KickPlates, NiceIce Resurfacer, BumperCaps and more. Everything in the NiceRink product family is made to last. Be confident in buying once and passing it on or reselling it down the road. The only real replacement item would be the NiceRink Liner as discussed in section #9 below. $25,000+ = 20’ x 40’(6Mx12M) regular refrigeration system with Coils, Anti-Freeze, Refrigeration Compressors. This will of course pretty much guarantee ice, but the cost is quite steep, and you’ll have an increase in your electrical bill as well. This topic could easily dominate backyard rink discussions as this is probably the most crucial element to having a successful outdoor rink experience. WHITE-WHITE-WHITE-WHITE! Make sure to get an Ultra-White liner on *BOTH* sides! To save your grass! Clear & White/Black liners as well as Blue Tarps are known grass killers, BUYER BEWARE! 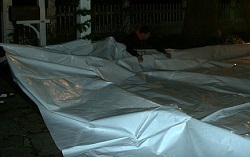 NiceRink Liners vs. Woven Tarps: NiceRink Liners are 5, 6 or 10 mils of solid water holding poly. Woven Tarps on the other hand are yes maybe 6, 10 even 12 or 14 mil thick, however the bulk of their thickness comes from the woven reinforcement in between two very thin ½ to 1 mils of coating to hold the water. The reinforcement doesn’t hold water; the poly is what does that. Once that ½ mil coating is compromised you you’re basically left with a woven fabric that doesn’t hold the water. They are heavier and harder to work with. Also, thicker doesn’t always mean better. NiceRink’s layered liners at .005 mil are 50%+ stronger than most others .006 and even .008. You’ll get what you pay for…..Be informed. Get the ONE-PIECE size you want. NiceRink has ELEVEN different widths IN STOCK available in ANY length you’d like. No need to buy extra and throw it away in the landfills. No waste! 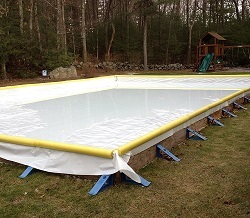 Liner warranty: NiceRink liners are warranted to hold the water when you get it. Some warranties on the market are for a 5 year “UV warranty”. That’s fine, but UV damage is not going to be the problem as the liners are covered with snow and ice during usage, so the UV doesn’t affect the liner. You need a good strong liner to do the work and add KickPlates if at all possible. What the rink is being used for; Hockey or just general skating. How the inside edges of the liner are protected. The inside edge of the rink right at ice level is the most vulnerable part of any outdoor temporary rink system. If the inside edges are not protected with KickPlates, the liner will be continually hit with sticks, skates, pucks, toe-picks, etc. That area will have little nicks and cuts in the liner. If that’s the case the liner, no matter what you use for a liner, will be a one year liner, or you’ll have to shrink your rink the following year so the little nicks/cuts are above the water line. 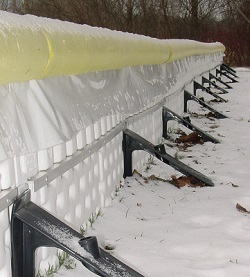 If the edges are protected at ice level, you can expect 2-5 years of life out of the liners. Regular Poly liners, probably 1-3, NiceRink #1 & #3 2-5 depending on the rinks use and how the edges are protected. How thick does the ice have to be to skate on? A good finished shallow side ice thickness is 4”/10cm. The deep end will be determined by the pitch/slope of your site. If you have an 8”/20cm pitch, then you’ll have 12”/30cm of water on the deep side. 4”/10cm will give you a good solid base to work with and usually enough thickness to maintain ice during the mid-winter thaws that have become unfortunately all too familiar. Should I fill the rink up all at once or do it ice layer by ice layer? There’s a lot of back and forth on this topic. Usually people layer because they are not using a liner, with a liner you can easily fill and forget. In my opinion there’s no reason not to use a liner other than the money a liner costs. Layering the ice will create a stronger ice block as long as that original ice block doesn’t melt or get soft. Filling a liner will take WAY less time and give you a great base ice to work with. Using a liner might take 30-45 minutes to install; layering ice could take weeks and sleepless nights of spraying. Once a liner is filled to 4”/10cm of water on the shallow end, let it freeze and done. This first ice will be more like pond/lake ice. That means it will be a “softer” ice containing small air bubbles and you can cut into it. Once it stays cold and you can layer your top coats during resurfacing you’ll then build that hard ice you’re looking for on top as long as that top layer stays frozen. There’s water around the edges my rink? All rinks built with a liner will have a shallow end and a deep end. The water the rink was flooded with will ALWAYS freeze from the top down. Most of the time it will NOT freeze all the way to the ground and there will be water under the ice, especially in the deep end. When you have the backyard game going and 2-3-4-5 skaters head to one corner, the weight of everyone will force the ice down, and subsequently force a little water up in between the ice and the liner. It will even “gurgle” sometimes. Most of the time it’s fine and the little water that does come will either retreat and/or freeze at the edge. How to deal with slush on a backyard rink? If your ice is too thin to get on and clean, you basically can do nothing. The best scenario is for the weight of the snow to push the ice down enough to force enough water onto the top of the ice so it ALL turns to slush. Let the slush freeze, and then you can skate on that base if it’s smooth enough or resurface a few times to get it back to smooth. If it snows on ice that is already pretty thick, 5”+ and the slush is only around the edges of your rink, then you can tackle cleaning it off. Personally, I would call “more than a few friends” over to help with this. Once you start cleaning slush off of a rink DON’T STOP, it must ALL be cleaned off and smooth. 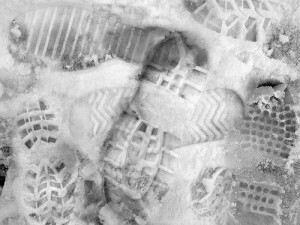 Whatever you leave on the ice, such as left over slush, or stopping half way will freeze at night and your ice will be full of FROZEN foot prints, shovel marks or the step-up where you stopped. Once it’s cleaned off, let the surface harden back up, then resurface as needed to get it back to glass. There are several methods of maintaining the ice. There is the flood method, spray and squeegee method, spray-spray-spray-spray, Hand Resurfacer and the Zamboni method. I’ll go through all of them in detail and you can make your own decisions for your rink, as you are the “rink manager”. The Flood –The flood method is simply that, flooding. 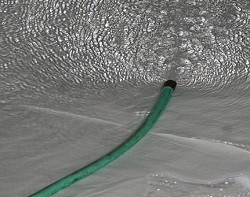 To flood the rink you’ll need to have the availability of large hoses and above average water pressure. You’ll need to get the entire rink completely covered with water before any of it starts to freeze. Do not use the flood method on smooth ice, you’ll wreck it. Spray and Squeegee– Again, simply spray water onto the ice surface and squeegee it out to the spots that need the most attention. Do not try and squeegee areas that have started to freeze. You’ll end up with mounds of frozen slush, which will have to be chipped or scraped off later when they freeze. Spray-Spray-Spray-Spray– The name says it all! The trick to spray coating ice is “wet ice is done ice”. In other words, start spraying a spot on the rink until it’s glossy and move on. Put the layers of water on as thin as possible to get a “Nice” glass like finish and also to prevent cracking or “lifting”. How water freezes will help explain this. Water normally freezes from the top down and it also expands as it freezes. Therefore, if you put too much water on the surface and it starts to freeze, it will first freeze the top and you’ll have your base ice, a layer of water and the top layer of fresh ice. Three layers; base ice-water-top ice. The water in between the two ice layers will then start to freeze and expand as it does so. As it expands, it can only expand up into the fresh ice, therefore causing the “lifting” of the fresh top ice layer and making it bumpy and/or uneven again which is called “shale ice”. If thin layers are applied, it will freeze solid with no expansion to give you the glass like finish that ice-skating has become accustomed to. NiceIce Resurfacer-The NiceIce ice resurfacer is the best and most economical method of resurfacing any ice rink. My personal backyard rink is 44’ x 88’(13.4M x 26.8M) and takes me a whole 12 minutes to put on a fresh coat of ice. It used to take me at least an hour to spray coat a new layer of ice and now, as mentioned takes about 12 minutes or less, with less water and a much better ice surface to skate on when done. I usually put two coats on when I’m out and the second coat takes less time than the first and provides a surface that rivals indoor ice quality. The single biggest detriment to ice is the oxygen/air contained within the ice. You’ll remember skating out on the ponds and lakes and when you made a sharp cut you’d get a big groove in the ice. The groove could be formed because too much air was contained within ice, allowing the skate to easily dig in and groove out the surface. Your base ice is basically the same as pond ice until it gets resurfaced and layered a couple of times. While utilizing the Patented NiceIce resurfacer, you will be laying down a very thin, fast freezing layer of deoxygenated water that will then become your skating surface. You now have the same ice surface that is laid down on the indoor rinks and sometimes better as air temperatures determine outdoor ice quality. Indoor ice is kept at about a constant 21-24F/-6-4C degrees. Your ice can be as cold as the outdoor temperature, 15F/-9C, 10F/-12C, 5F/-15C and so on. Hard, de-oxygenated ice is good, fast ice and will not get chewed up as much. It requires less maintenance time so there’s more skating time!!!!! The NiceIce resurfacer is also great when Mother Nature doesn’t cooperate like we would appreciate her doing so. When she dumps snow, rain, sleet or slush, it has a definite tendency to mess up a rink surface very quickly. The NiceIce resurfacer can lay down approximately ¼”/.635cm to ½”/1.3cm inch of ice in an hour, depending on the outside air temperature which usually takes care of even the most severe rink surface in a maximum of 3-4 hours of walking. Ice cracked, how can I fix it? 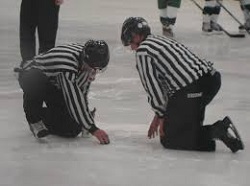 Just like you may have seen on TV or the local rink when a hole is created in the ice, the ref/players will scrape some ice shavings, pack them in the hole, wet it and then smooth it over with a puck. Same goes for your backyard rink. Grab some snow, assuming you have some, and pack it in the holes and cracks, wet lightly and smooth over the best you can with a puck, or even a concrete trowel and let it freeze. Before you get any cracks and/or when you fix any holes/cracks you have in the ice, and it’s cold enough and going to stay cold enough to keep your ice frozen, you can and should put many “thin” layers of water/ice on the rink, letting each layer freeze before adding another layer. This will give you a harder ice surface on the top and be less prone to cutting, chipping and cracking as long as it stays frozen. ALL in ALL…..A backyard rink can bring you years of unlimited Frozen Memories to last you, your family and friends for a lifetime. The choices at NiceRink are infinite, the possibilities are limitless, and our product reputation is second to none. Backed up by a superior customer service staff and years of knowledge to help you. The right decisions make all the difference! www.NiceRink.com or Toll Free at 888-NiceRink for Superior Products, Superior Knowledge & Superior Service. First time rink builder and hit many fun learning curves but I am stumped now…. I have a liner and it holds water (after server patches); however, after some good cold weather, it warmed up to 40F and all was melted (boo). After 3 days of having a pool, the weather dropped back to the single digits and the rink froze. Here is my issue; for what ever reason, air got trapped under the liner. while the rink was freezing, the air was pushed to the center of the rink and eventually all is now frozen. The thickness all around the edges are upward of 5+ inches but the center is less than 2 inches and cracking. In one spot I was able to feel the liner and although pliable it is stuck to the underside of the rink. I was thinking I could just layer ice until I get 5 inches above the air bubble but that could take a very, very long time. Any suggestions on how to move forward in the quickest and best way? I think I have a solution to rough ice. I used a pressure washer tonight and it went great, much better and much faster than I thought it would. I thought I would have to use the ‘spray’ on the pressure washer nozzle, but I found the ‘laser’ setting to be most effective. It is warm out this evening and there is no wind. I thought I would end up soaking wet, but I didn’t get wet at all. Since the power washer uses very little water you are not flooding the rink as you blast away. I’ve been making backyard rinks for years and scraping to get ice smooth is like chipping concrete, the pressure washer has been the most successful thing I’ve tried yet. Rough ice. Crap! It happens. Snow, then rain, then the ice is too thin to walk on and shovel off really well. So how to cure this? I’m going to wait until the ice is thick enough to walk on again. Anyone try these ideas for rough ice? idea 1) steel fire pit. I’m thinking of starting a fire in it and pushing it around the rink to melt down the rough spots, of course I’ll protect the exposed tarp when I get close to the edges. idea 2) using a pressure washer to blast down the high spots. Anyone ever try these ideas? Or any ideas to cure rough ice? Yes, of course prevention is the best cure, but sometimes sh*t happens. thanks for any ideas. Having an issue where my shallow side of the rink (3-6″ corner to corner) is not freezing form the boards about 18″ into the rink. Deeper side (8-12″ corner to corner) is frozen solid 2-3″ thick. High of 26 and low of 16 past two days. Any advice? Thoughts? I’m a first time rink builder. I have a 22’x33′ rink with about 2.5″ at highest point, and 17″ at my deepest corner. My deep ends have 2′ high 7/16″ OSB with home-made kickers made from 2x timber and 2′ long steel rebar. I have a 6 mil poly liner with plenty of overhang at each side. On fill day about 3/4 through I noticed saturated soil and some water outside my boards at my deeper end, so naturally I figured a leak. After I shut off the water I marked and measured the water depth at all 4 corners, this was about 10 pm. Overnight temps. got down to about 23F however in the morning there was no ice layer, not even a thin sheet. I figured this had to do with the water movement due to the leak (leak was faster than the freeze rate) so I measured the four corners at approx. 11 am next day, the water level was the same as previous day. It may be too early to speculate, but I would think 13 hours later the level would drop a bit due to the leak. Also, I used some dye and tried to locate the alleged leak, however was not able to do so, the dye just dissipated. Is it possible the soil below the tarp is getting saturated by the leak and settling, therefore compensating for the decrease in water depth I’m looking for? I know the remedy would be to mark the liner at the top of the boards so i can tell if the ground is settling pulling the liner down with it, I did not do this however. Anyway, I’m a bit perplexed by this scenario. Any help would be appreciated. The water temp from a faucet is 55 degrees. Maybe you don’t have a leak, but the frozen ground, ice, and/or snow may have thawed out from the heat of the 55 degree water. It takes a few days before this mass of water cools off enough to start freezing. Started late this year and have had snow problems (1.5 ft) as I was trying to get the base layer to freeze. Now I have ice but its sloped more than I thought it would and it created ridges thru the middle of the rink (36×50). So I have a decent flat high side and a decent flat low side, but the middle is not too good at all. Any suggestions for this?? If you have small holes in your liner, you can buy glue that will stick and fix the hole even with water filling it. I had 2 holes about 1-2 inches each. One hole just filled with glue and it worked (while it was under water. For the 2 inch slit, I got extra liner piece and used e6000 and sealed slit. It worked within a minute or two…. Yes numb fingers, but sealed rink. We seem to have holes in the plastic and now have air pockets under our ice. We have flooded it several times and the water keeps draining away under the ice. If we get a couple of inches of ice build-up over the air pockets will we be able to skate on it? We have a fairly small rink and live in SW Ontario which isn’t the best weather for rink making. Thanks! I ran into the same problem with my rink, I live a bit North of you in Petawawa where we can easily see -40*C. I had the hollow sounding ice even in my deep end, I tried to drill holes and freeze from the bottom up, however as you have read here on this page, water does not freeze that way and will cause issues. I still skate on mine but it require more maintenance than if there were no pockets, I believe the thinnest part of my ice is about 2.5″ and the air pockets don’t affect skating too much, just be prepared to put in more hours of surface repair. I built a 30 x 60 rink for my 17 year old. Its got a bit of a slope, 3 inches on the shallow end and 12 on the deep. It’s all frozen as the weather has been frigid here the last two weeks but today he went to skate on it and about 1/3 from the shallow end it cracked severely as if the ground underneath was sinking. I’m thinking the ground had dried out as we installed the rink during a wet period in December. We actually filled it mostly with rain water. He has tried to lay layers of fresh ice but it keeps cracking. I’m thinking should we just jump on it to finish collapsing it and rebuild it up with water? He’s pretty bummed out about it. Is all lost? It sounds like you have a pretty big crack. You could try packing the crack with snow and then wetting (a lot) the crack and compacting the snow into it ( i use a puck). I have done this successfully with small cracks. I am wondering if you have a small leak below the ice surface that has caused some of the unfrozen water to leak out? Careful with the jumping you mention that you do not cause a tear in the liner. Thanks for this post. I just started making my rink a week ago by using the “stamping down snow to make ice” or the old school way. I have no liner or boards. I’ve watered it for several consecutive nights now as well and have a a nice layer of ice. It’s been snowing at a good clip for several hours now and am now sure what to do. should I water it or does that depend on how much snow has fallen (or how thick my ice is underneath)? The ice underneath isn’t smooth or anything. It’s pretty rough still because of all the stamping down. Thanks for you help! We have a small backyard rink. With the mild weather we’ve been having, the liner has been sitting empty for over a week. When I went to fill it today, the liner had shifted and bunched in spots, which are now frozen to the ground. Are we SOL for a rink this year or is there a way to thaw the liner from the ground without damaging it? I thought warm water, but hubby thinks no. I would hate to write off the year so soon. Not sure if you are in Southern Ontario or not but tomorrow is suppose to be +7. 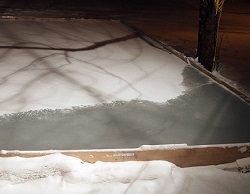 I’ve just filled my 16 x 40 lined rink overnight. The shallow corner is 4″. The deep end is about 15″. I just read the top 10 questions which suggest the max depth should be 10″ and the various comments by visitors here regarding problems with deeper depths. I will likely level the yard more next year but, since I am now committed, other than waiting as long as possible to let the deep end freeze as much as possible, does anyone have any tips or suggestions for my situation for this year? Thanks, Jim. We survived the +7 in Toronto over the weekend, I cleared a lot of slush off yesterday, and we’re back in business with the cold weather now in place. Will check the ice thickness tonight and hope to be skating soon. While it is true deeper water is more challenging, if you reinforce the sides proper you should be ok. My deep end is almost a yard deep and the kids were skating on it yesterday with about 2.5 inches of ice. I am trying to figure out how to deal with the latest snowfall in MSP and the impact it had on my rink. All was fine, but I tried to clear the snow to early (as the ice below the snow had not refroze yet). We had 4 or 5 days of above 32 degree weather. I was able to get most of the snow off, but I had two sections that were too wet to remove. Now, I have a block of ice on two sections that are about 2″ higher than the rest of the rink. I have access to hot water, but i am not sure if I should do a big flood or if I should try and chip all of that down. I worked on chipping this morning, and it was tough work. I am not sure I will ever get it even. I have had the same issue before: I have used both the hot water and chipping approach. Both were relatively equally effective although the chipping approach took a ton more energy. I have also hooked a garden hose to an inside facet and hit the elevated areas with HOT water with a nozzle attached to the hose. You will see the ice melting and can judge when to stop. Here is a dumb question. 3rd year using a nice rink liner. I have about a 5 inch sloop in my backyard. I put 5-6 inches in the shallow side. I filled it up las night and the level fell a couple inches overnight. I can’t seem to find evidence of water outside the rink. How do you figure out where the hole is? This is not easy. I have been lucky some times and can see it. Many times it is only a small slit from a skate and almost impossible to see. Keep looking for the water leaking out. In theory it would drain to the level of the hole so this may help you determine where the leak is. I gave up a few years ago using the same liner because of this exact reason which I have heard many people have the same issue. If you have a big drop in land what can you fill that with do there’s not 2 feet of water in one area?? I used old pallets I picked up at nearby stores that throw them out. I also bought bags of mulch that I will end up using I the spring. For the pallets just make sure to cover the edges so you do not tear the liners. I used some old carpets and tarps. I have some gaps between my boards where ground was not level. And idea how to cover gaps so liner doesn’t pop through? Here’s a doozie of a problem. So I have been making back yard rinks for many years now. This year I was proactive and had everything set and ready for go for the winter season. My rink sits on a surface where one corner the ice is 1’6″ think and 3″ at the onther. The weather was relatively cold -5 a nights for over a week then we had a spell of -20 hitting us for a week. I figured the ground was frozen and as soon as the -20 hit I put out the liner and filled it. It frozen nicely over 3 days. I thought all was good so I sent the rug rats out skating. after 3 days of skating I started noticing that the one corner had water outside of the rink meaning one thing…. a hole!!! What I assume happened is that I didn’t wait long enough for the ground to freeze and putting 1’6″ of water over it acted like insulation keeping the bottom thawed. I think the weight of the kids forced the ice down and a sharp part punctured the liner and every day the ground is melting the ice and the one corner of ice is dropping over an inch every day. Does anyone know of a slick method of filling the hole under the ice with some magic? Id hate to have to remove over a foot of ice from one corner carefully just to repair the hole. I have to go out everyday to lower my protective boards to stop pucks and skates from punching the liner for when it gets cold enough for me to fill. What I really need is -30 for a few days to freeze things solid. haha. Any tips or tricks would be greatly appreciated. This is my second year of rink building. 24×48 size rink. I have a VERY large slope 30+ inches in my yard from top corner to opposite bottom corner and my yard bows in the middle. Last year I flooded the rink over a couple of days but my rink boards blew out(nice rink boards but my fault for not securing with reinforcements) and I had to start over with flooding after securing the corner with the most pressure. I must have torn the liner because when I flooded again, it froze but I think the water underneath leaked out and it froze with a slope. Additionally there was about 3 feet of ice in the bottom corner and 2 inches of ice at the top(which kept cracking all season). Do I flood the entire rink again all at once and hope I have secured the boards enough or do I layer? The one problem I have is that I’m using a garden hose and parts of the rink start to freeze before others. If the answer is layering then how do I fill the lowest corner while still getting water up to the top with such a severe slope uphill(water is not getting to the upper part of the rink). Cold is not an issue as I am in Minneapolis. I know I’m not alone in this issue, any help would be greatly appreciated! I’m constructing a 24×48 rink with 27″ of slope. I would love to hear how this turned out. I know this is an old comment/thread….any chance you’d be willing to share pictures via email? Thank you! How tall were your boards and the brackets you used. I have a 20″ slope. I bought 24″ boards, have nice rink brackets and then I have installed support every two feet. This is my first year. Hoping everything holds. So far so good. My boards are 36″ at the highest point, but no brackets, since I have 2×4 framing. I put wooden stakes in every 2′ or so, to secure the bottom, and a bunch of braces that are secured to more wooden posts, to secure the top. Now that it has been cold a while, my concerns about water puddles have gone away — no puddles, and it’s solid as a rock. I’m going to try a bigger rink next year, which means an even bigger slope, but I know what’s involved now. You can do the layer approach, but that will likely take a lot of time. I have roughly the same grading, ie 3 feet in the deep end and 3 inches in the shallow end. Originally I had the same blow out issue you had, in the following years I added a lot of reinforcement and have filled it completely at the beginning of each season there after with no issues. FYI my rink is 24 x 64 with roughly 15 cubic yards of water. Looks like you posted this a year ago, but I have the same situation, and want to make sure I’m doing the right thing. I have 4″ in the shallow end, and 30″ in the deep end. I had some materials from old shelves that were made of 2×4 frames with 5/8″ plywood, and used that to box out the rink, and it’s very sturdy – lots of reinforcement – so I’m not concerned with a blow out. However, I am concerned that once it freezes the ice in the deep end will sink, and I’ll get puddles on top of the ice. Is this an issue? I thought about putting a 2×4 lip inside the boards about 4 or 5 inches under the water line, but didn’t end up doing it. Is the ice sinking an issue? I just filled it up yesterday, so I guess I’ll find out in a few days (it’s supposed to get cold tomorrow night), but if I’m doing something wrong, I want to fix it tomorrow before it gets really cold. Considering your situation your best to layer the ice and build it up a 3-4 inches at a time, considering your slope this will take a significant amount of time. You wouldn’t layer your entire rink you’ll flood it and have it pool and build on that until you have finally reached the high end and covered it with at least 3″ of ice. Is there any possibility to back fill your low spot with dirt sand or aggregate my rink is in my parking lot and has a 12″ drop I ordered up 2 loads of gravel and spread them out to create a level surface I covered the gravel with a couple inches of leafs to protect the liner and installed my boards and liner and flooded, it has worked well so far. Although the rink liner manufacturers say you don’t need a level yard this is a bit of marketing slyness obviously almost no one has a level surface so in order to sell rink kits etc these guys tell you go ahead and build on uneven surfaces… You can, but your learning first hand how difficult it can be, I would promote levelling for sub surface as much as possible. How to hockey how big are the bords are in the NHL and how Long is the NHL rink. I trying to build a big backyard real size rink for my dad birthday. I would really like to build a rink in my backyard next winter but I don’t know where to start. I don’t need a HUGE rink but I would like a decent size. What are some dimensions to start thinking about? Also what are some effective ways to resurface the ice? 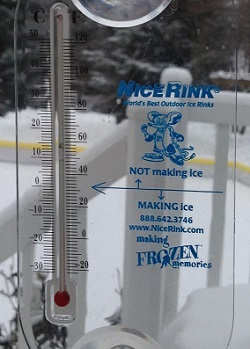 Please give us a call at 888-NiceRink M-F 8-5 to or email info@nicerink.com or visit our website http://www.nicerink.com. We’re a year – round company and here to help you make some perfect Frozen Memories. Thanks guys appreciate the info. It seems that there’s not much that can’t be solved with more flooding (just not too much all at once). Any tips for installing a rink right now, when the yard’s covered with snow? Do we need to remove most all of the snow from the place we want to put the liner, or can the liner go on top of packed snow? Eric, I would definitely try and remove as much of the snow as possible. There are two problems with not removing the snow. 1) The snow can actually suspend the liner and subsequently the liner/ice above the ground surface leaving an air gap under between the liner and the hard ground. Then when an adult skater and/or group of younger players skate over that area, the ice “could” crack and drop under the weight pressure of the skaters. 2) If the snow has melted and refroze, that ice could break under the liner when filling from the water pressure and create sharp edges of ice under the liner and possibly cut or puncture your liner. Is it best to flood the ice, in small layers, when the temperatures are below zero (at night) leading up to a predicted warming? Or to just leave the ice alone? We are having + 9 C on Saturday, but it is still cold at night during the week. SO we are thinking we may be able to get a nice thick base happening. Charlie, that method requires that you physically have to be out there spraying the water on in thin layers and letting each layer between your next layer. If you just leave the hose there with running water, it will create a hole as you described. This same situation occurs on linered rinks. Once you have ice, you have to layer it to build more. For the bumpiness, are they big mounds here and there, or there lots of little ones? Was the snow as smooth as possible before you started? You can use an ice scraper to lop of the high spots and then further layers will start to build ice and eventually get to the same height for a smooth ice surface. This method takes a lot longer but only costs you time. Hi, This is the first year I’ve tried to make a backyard rink and I’m doing it on cement and not using wood, just freezing snow as boards to keep the water in. I thought if I flooded my rink after it had about 2 layers on already, the water would flow to the spots that need water to make the ice lever so I left the hose running and after about 5-10 minutes the hose created holes in the ice from only falling on one spot. Should I use snow to fill in the hole or another method? Paul, shoot me an email jim@nicerink.com and we’ll see if we can get this figured of out for you.